Let this be a lesson to all UFC fighters, devastating finishes can do wonders for your championship aspirations. Despite getting annihilated by Cain Velasquez (Pictured) just three scraps ago, Antonio “Bigfoot” Silva has earned himself first crack at Velasquez’s crown following back-to-back knockout victories. This week’s edition of FUEL TV’s UFC Tonight announced the rematch will headline UFC 160 on May 25th. 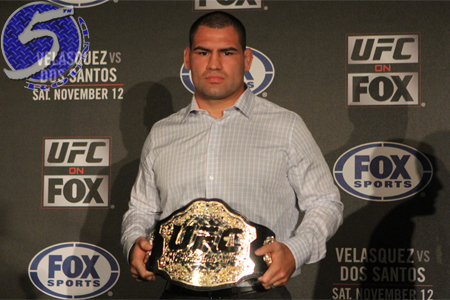 Velasquez avenged the lone blemish on his résumé by trouncing Junior dos Santos at UFC 155 to reclaim his throne. The 30-year-old owns a dominant 11-1 professional record, with nine of his wins ending via some form of knockout. After losing to Velasquez in his big league debut, Silva has rebounded nicely by serving up consecutive upset specials. “Pezao” defeated a one-legged Travis Browne in October and rallied to finish Alistair Overeem earlier this month. MGM Grand Garden Arena in Las Vegas, Nevada hosts the festivities. A 265-pound shootout between Junior dos Santos and Alistair Overeem co-headlines the gig.